What do you want to see happening in your favorite public spaces? This is one of the questions at the core of the Placemaking process, and getting responses from as many different people as possible has always been central to what we do at the Project for Public Spaces. But now, as our work in Detroit evolves, we're taking our own oft-given advice about thinking Lighter, Quicker, and Cheaper, and testing out some new ways of gathering input and getting more people excited about shaping their public spaces. Over the next few weeks, PPS's Steve Davies, Elena Madison, and Meg Walker will be conducting a series of "Pop-Up Placemaking" workshops with Detroiters at the Downtown Detroit Partnership's D:hive, an innovative social gathering space along the city's famed Woodward Avenue corridor. Packing the punch of a standard day-long Placemaking workshop into a few hours, these specially-designed sessions will offer participants a unique opportunity to be intimately involved with the continued transformation of downtown Detroit. Workshops will take place from 5-6:30pm on December 5, 11,12, & 18. And based on the response that we've been seeing at events in the Motor City recently, we're on the edge of our seats, excited to see what people come up with. Recently, Davies, Madison, and Walker set up a "Placemaking Hut" at the Christmas Wonderfest tree-lighting ceremony and holiday market in Campus Martius Park, where people were invited to share what kinds of amenities and uses they wanted to see more of in downtown public spaces. Upon entering the Placemaking Hut, everyone was given eight dot stickers. They were then able to peruse images of 12 different amenities and 12 different uses, and place their dots next to the images of the things that they wanted most (four from each of the two categories). 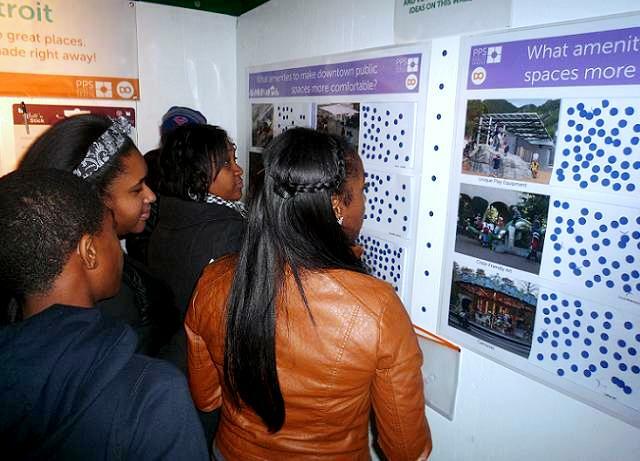 This visual voting system not only made the important data-collection phase of the Placemaking process fun and interactive, it also built off of the festive atmosphere at the Christmas Wonderfest event (which attracted tens of thousands of Detroit-area residents) and generated a steady dialog between people about how downtown should evolve, putting place at the center of the discussion that evening. The Placemaking Hut proved to be so popular, in fact, that we ran out of dots just a few hours into the festival! Considering that there were 3,000 stickers on-hand, an estimated 150 people moved through the hut per hour, providing a wealth of feedback about desired uses. That information, along with results from the upcoming Pop-Up Placemaking workshops, will be used by PPS and D:hive to craft a Lighter, Quicker, Cheaper plan for the activation of Downtown Detroit this coming summer. In case you're thinking that 16 amenities and uses sounds a bit too prescriptive, fear not: plenty of crayons were available, and participants young and old were welcome to draw things that they wanted to see in their public spaces on a large flip chart if they couldn't find a corresponding image on the hut's walls. "We forgot to include a dog park image," Davies recalled while recounting the story in the office this week. "Big mistake! 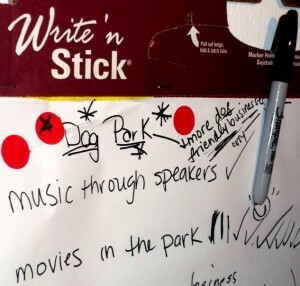 So many people were using the crayons to ask for that; if you flipped through the chart, it was 'dog park, dog park, dog park!'" We'll keep you posted on how things turn out at the pop-up sessions this coming month; if Detroit lives up to its burgeoning reputation as a hub of urban innovation, these Pop-Up Placemaking sessions could soon be making their way to a public space near you!